Three words. Fudgy. Brownie. Cupcakes. 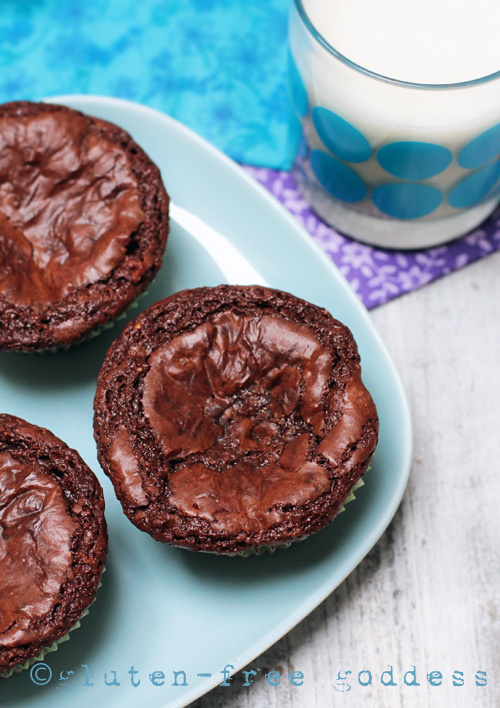 Lately we've been experimenting with baking brownies in a cupcake tin. Just for a change-up. We felt like tweaking again. We're using Baker's chocolate now (semi-sweet and unsweetened). And we're favoring hazelnut flour. We boosted the baking soda a tad. When they bake they rise and fall and crack like little flourless chocolate cakes. By Karina Allrich April 2013. 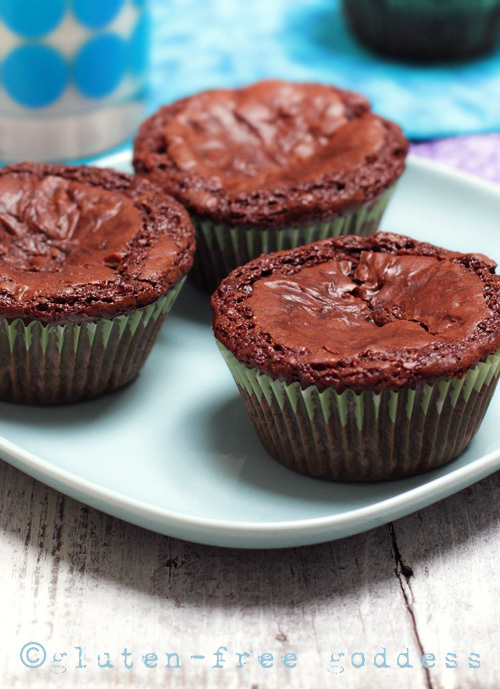 These rich and chocolaty little cakes are like a gussied up brownie. Soft and fudgy in the center, with a delightful, slightly crisp outer edge. 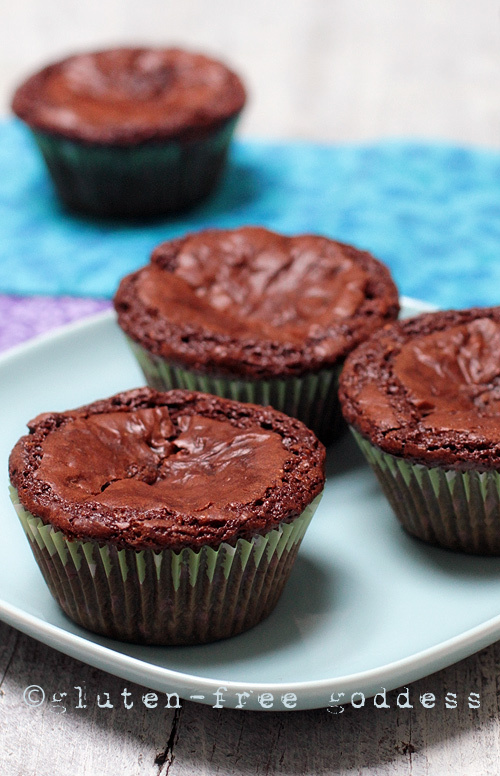 They remind us of flourless chocolate cake. Preheat the oven to 350ºF. Line a 12-cupcake baking pan with paper liners. Melt the chocolate in a double boiler over low heat, gently stirring. When the chocolate is melted, remove from heat and stir in the oil to combine. In a mixing bowl whisk together the light brown sugar, hazelnut flour, sorghum flour, fine sea salt and baking soda. Add the eggs, vanilla extract and melted dark chocolate mixture. Beat for two minutes, until the batter thickens and becomes smooth and glossy. Stir in the chocolate chips by hand. If you are adding nuts, stir in by hand. Drop the batter by spoonfuls into the 12 baking cups. Bake in the center of a preheated 350ºF oven for 22 minutes, or so, until the brownie cupcakes have risen, cracked and fallen. They will look like mini flourless chocolate cakes. 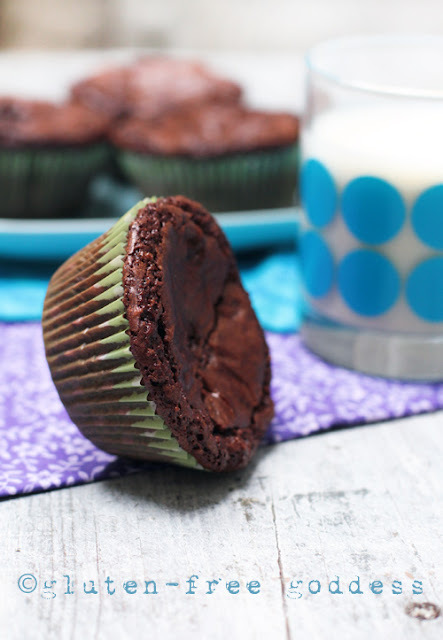 Do not over-bake- especially if you like a fudgy soft center. *Good vanilla extract has a deep, vanilla bean flavor with no high fructose corn syrup added.